Upon his graduation from Washington & Jefferson College in 1981, Roger Goodell sent out approximately 40 letters to the National Football League (NFL) and each and every team. He received a pile of rejections, but one response from the league said he could stop by if he was ever in the area. The rest, as they say, is history, as Goodell capitalized upon that first break as a public relations intern to begin a 28-year NFL career that culminated in 2006 when he was elected to his current role as the leader of perhaps the greatest sports league the world has ever seen at the absolute apex of its popularity. But long before his all-night drive to New York, Goodell knew that becoming NFL Commissioner was his dream job. It all began at age six, when he began sleeping with a football in the nurturing home headed by his late father, U.S. Senator Charles Goodell. 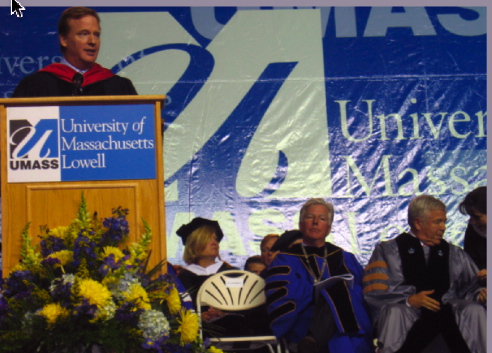 And it was his father’s distinguished career that led to him telling this story last Saturday as the commencement speaker to the largest graduating class in the history of University of Massachusetts-Lowell. During the ceremony, the institution bestowed upon Sen. Goodell a posthumous Doctor of Humane Letters degree that was accepted by Roger and his four brothers, Jeffrey, Michael, Timothy and William. The 51-year-old Commissioner spoke with heartfelt emotion about his father, who was appointed the Senator from New York in 1968 to fulfill the seat of Robert F. Kennedy after he was assassinated. That legacy caused Goodell to implore the graduates to “go make a difference,” which he himself has clearly done in his first four years as Commissioner. He offered some other pointers to graduates in response to questions they had earlier submitted, which serve as Goodell’s guidelines for success. With these points as perspective gleaned from his catapult of a career, it was easy for Goodell to remember what he did when he was in the shoes of the graduates seated before him. That pain has become gain, as Goodell has welcomed change and innovation in not being satisfied with the status quo. From the personal conduct policy to playing regular season games in London, Goodell usually gets what he wants and the league’s 32 owners are clearly behind him. This support will be of paramount importance as Goodell faces perhaps his biggest challenge, implementing the new collective bargaining agreement with the players. These high-anxiety negotiations will surely test Goodell’s mettle, but his father’s counsel will clearly keep that pressure in perspective as he continues to do the right thing. Cool indeed, particularly when you consider how many of today’s college graduates would say this about any commencement speaker they were about to hear? No many—if any—and basically reserved only for the man who rose from intern to quite possibly the greatest job in the world. John Ingoldsby, president of IIR Sports & Entertainment, Inc. (www.IIRsports.com) near Boston, is a free-lance writer and former reporter who has written for numerous media outlets, including magazines, newspapers, and internet sites. He is a member of the Professional Football Writers of America (PFWA) and National Sportscasters & Sportswriters Assn (NSSA), and has covered both the New England Patriots and Pittsburgh Steelers dynasties. Copyright © 2010 College Athletics Clips. All Rights Reserved.